There were games of cards and chess was popular. Chess championships were held whenever possible. On one occasion, in August 1917, 14 chess boards were in use by finalists in the hastily built extension called the ‘Canadian Lounge.’ A visitor appeared enquiring about playing a game and Tubby told him to wait. Time was limited as the house closed at 9pm. The visitor surprised him by requesting to play all 14 winners simultaneously! This was arranged very quickly and the unknown visitor, a gunner in the Salient, played the games as desired. He won 12 and drew 2. He then bid everyone ‘goodnight’, left, and was never seen again. By 1916, there were so many recreational activities going on and so many visitors that the space was becoming noticeably too small. Fortunately, an extension was possible by taking over the 1st floor of a neighbouring hop store and before long the Concert Hall was born. This space soon became very busy with debates, films, concert parties, talks and drama. The range of activities was vast and it increased the appeal of Talbot House even further. It also made it even more like clubs back home, where, space providing, members would organize concerts, lectures, talks and similar events. We should not forget the Chapel, to be found right at the top of the House up a very narrow step ladder. The original intention had been to provide some religious comfort to those who needed it and it was an important part of this facility. Regular services were held and it was open for quiet contemplation at any time for visitors. Perhaps being at the top of house, it was the nearest place to God in the building. 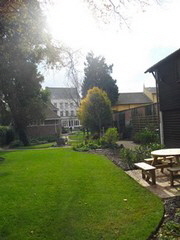 Heaven could also quite possibly be found in the garden of Talbot House, which Tubby lovingly developed over the years. It might have appeared to the visiting soldiers to be just like sitting in an English country garden. It offered a glimpse of beauty, peace and quiet. Another place for contemplation.